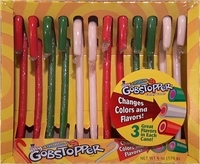 Gobstopper candy canes are shaped like a candy cane but they are solid in color with no stripes plus the change colors and flavors as you eat them. Leave it to Willy Wonka to come up with an unique twist on the classic candy cane. If you like wonka's everlasting gobstoppers you are going to love these candy canes. Each box has 12 individually wrapped candy canes.